Mikalojus Konstantinas Ciurlionis (1875-1911) was born in the southern Lithuanian town of Varena, near Vilnius. Doubly talented, he was a visual composer who could hear colours and see sounds and whose life was comprised of the close interaction between musical and artistic composition. In his homeland of Lithuania, Ciurlionis was celebrated as an exponent of musical modernism and the founder of a national school of music. Yet he was without doubt an avant-garde artist of European standing, an artistic visionary between the late Romantic and Modern ages. Many prominent personalities of that timeRomain Rolland, Igor Stravinsky, Jacques Lipchitz, Isadora Duncanwere interested in Ciurlionis. This, the fourth recording in the complete piano music of Ciurlionis, is dominated by works from his mature period. In 1904, Ciurlionis turned towards modern tendencies in music. In his piano preludes, and variations of following years, one can find origins of the compositional techniques and expressive means that were later exploited by the composers of the Second Viennese School, and representatives of other tendencies of the first half of the twentieth century. The most striking feature of Ciurlionis's compositions written in these years could be called artistic constructivism: here every short prelude or variation becomes a sort of mathematical riddle, solved by the composer with musical means. The programme of this recording is made up of three sections: Sonata in F major, piano pieces from 1903-1906, late preludes from 1908-1909, and compositions notated from memory by Ciurlionis's contemporary Viktoria Hemplowa. 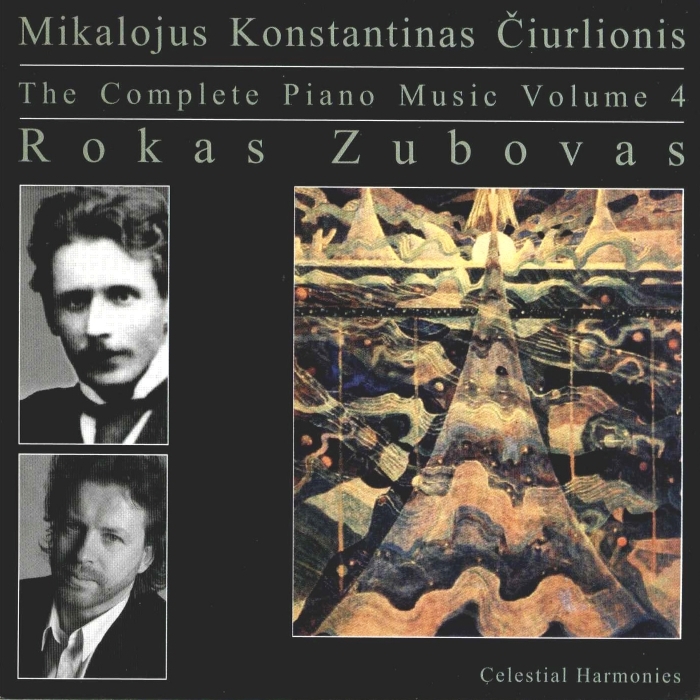 Recorded in München, as a co-production between Celestial Harmonies and Bayerischer Rundfunk, this is volume four of the first ever recording of the complete piano music of Mikalojus Konstantinas Ciurlionis. The pianist, Rokas Zubovas, has been a faculty member at the Piano Department of the Lithuanian Academy of Music and Theatre since 2000. From 1994 to 2000 he taught at the Music Department of San Xavier University in Chicago, Illinois. Occupying a special place in his repertoire are the works of his great-grandfather, the famous Lithuanian composer and artist Mikalojus Konstantinas Ciurlionis. Born in Lithuania, Zubovas started his piano studies in Kaunas under Rimante erknyte. He received his undergraduate degree from the Lithuanian Academy of Music under Prof. J. Karnavicius, and later earned a Master of Music degree from DePaul University in Chicago under Prof. D. Paperno. In addition, he has studied extensively in Zurich, Switzerland, at the International Heinrich Neuhaus Institute where his teacher was pianist Esther Yellin. In the United States he also studied with the pianists Edward Auer and Andrius Kuprevicius. Zubovas has appeared in recitals and various festivals throughout the United States, Canada, Argentina, Uruguay, Switzerland, Norway, France, Italy, Greece, Lithunania, Russia, and other European countries. He also regularly performs in a piano duo with his wife, pianist Sonata Deveikyte-Zuboviene, and also as a chamber musician with various soloists and ensembles. 1 Moment musical fis-moll VL 163 1'14"
2 Prelude a-moll VL 241 op. 13 Nr. 1 1'26"
3 Prelude G-Dur (Lullaby) VL 242 op. 13 Nr. 2 4'37"
4 Prelude f-moll VL 251 op. 13 Nr. 3 0'59"
5 prelude b-moll VL 252 2'04"
6 Prelude Des-Dur VL 253 2'00"
7 Prelude D-Dur VL 272 1'31"
8 Prelude A-Dur VL 247 op. 14 Nr. 1 1'37"
9 Prelude g-moll VL 248 op. 14 Nr. 2 1'17"
10 Prelude h-moll VL 249 op. 14 Nr. 3 2'22"
11 Pater noster VL 260 op. 17 Nr. 1 2'39"
12 Autumn VL 264 op. 17 Nr. 2 1'38"
13 Prelude d-moll Dialogue VL 261 op. 17 Nr. 3 0'42"
Sonata F-Dur VL 155 22'27"
18 Prelude B-Dur VL 257 3'38"
19 Impromtu d-moll VL 298 0'56"
20 Prelude Remembrance VL 299 3'06"
21 Prelude C-Dur VL 318 0'46"
22 Prelude d-moll VL 319 2'25"
23 Prelude c-moll VL 324 1'09"
24 Prelude h-moll VL 326 2'20"
25 Prelude h-moll VL 329 1'19"
26 Prelude C-Dur VL 331 1'54"
27 Prelude C-Dur VL 330 1'05"
28 Mazurka G-Dur VL 170 1'15"
29 Polonaise A-Dur VL 173 1'00"
30 Lithuanian Lullaby VL 174 1'10"
31 Prelude h-moll VL 176 2'21"
32 Mirage a-moll VL 175 4'02"